The signs and houses are arranged by element. 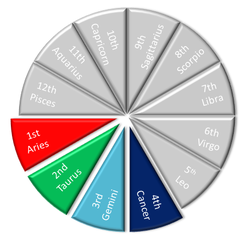 Each element has a unique role to play in the balance of the zodiac. Because this balance is woven through the houses and signs, a thorough understanding of the elements is essential in truly grasping the essence of each sign and house. The zodiac is actually organized according to element. So, to understand why fire signs are forthright and impatient, for example, it is key to know they are always the starting element in each group of signs and houses, which creates a spark of inspiration in each of the three sets of signs and houses. ​The three sets are the personal signs, relationship signs and universal signs, which correspond to the personal houses, relationship houses and universal houses. All are organized by element. There is a gradual death that occurs as we cycle through the zodiac. The zodiac represents the story of one complete life cycle from birth to death, beginning with the birth of Aries and the first house and ultimately ending in Pisces and the twelfth house. It's an understanding of the elements that reveals this cycle and gives us a greater appreciation of each element's contribution to the universe. Always first in each group, fire initiates and expresses. ​Because fire is first, its job is to push forward by initiating and inspiring. As the first element in each group of the zodiac, fire's job in the universe is to initiate and inspire. Fire represents the sheer force of inspiration and expression - nothing else. It has no forethought, emotion or practicality, as these things do not represent the purpose of fire. With fire, there is only the energy to begin things. Fire doesn't ponder, it acts. It doesn't feel, it reacts, and fire doesn't consider the long-term. Fire lives in the moment with full expression of everything that constitutes that moment. It never holds back. It can't. The energy of fire is not containable. It must be expressed fully and completely or it will burn and destroy. Fire-Sign People - Because their purpose in the balance of the universe is to initiate, inspire and express, these people are impatient, and assertive. They are outspoken because they don't think, feel or plan before they act. They tend to be honest because they don't filter their words with thought or feeling. This same lack of filtering and planning, along with the constant burn of fire's intense energy, also makes them quick to anger. The burn of fire's energy keeps them active and makes them bore easily. Outlets for their energy are necessary to keep their powerful internal energy from burning them from within. Although the constant outpour of the intense energy of fire-sign people can be difficult at times, they should not be stifled. Asking a fire-sign person to suppress their energy will cause anger and depression. An understanding or their essential nature and their role in the balance of the universe helps the other elements have patience with them. Fire Houses - By beginning each of the three sets of houses, the fire houses inspire new life with the sheer force of unbridled, enthusiastic self-expression. The first house of Aries begins the personal set of houses. In this set of houses we develop ourselves as individuals. In the first house we inspire this development with personal self-expression in terms of our self-image. In the fifth house, we inspire the beginning of the second set of houses, the relationship houses, where we switch our focus to how we relate to others. In the ninth house, we inspire the beginning of the universal houses where we learn a global point of view. Always second in each group, earth puts fire's inspiration into physical form. ​Because earth follows fire, earth's purpose is to pull back fire's energy and structure it into something real. ﻿As the second element in each group of the zodiac, earth's job in the universe is to put fire's spark of inspiration into physical form. It finds real ways to turn ideas into tangible products. Earth does the planning, finds the resources, points out the possible pitfalls and takes the time to do the work that makes something real out of what fire starts. Patience and realism are earth's contributions to the balance of the universe. Earth is not an initiator. It doesn't inspire. It's energy level is low but steady. Earth is about the long-term. Knowing how to stick to a plan and see it through to real results that generate real physical rewards like a product or money is earth's forte. Earth-Sign People - Because their purpose in the balance of the universe is to lend the patience and realism needed to translate inspiration into real form, earth-sign people are slow moving, and stable. They are practical and realistic. Earth-sign people know that rushing leads to mistakes, and they know that energy is a commodity. If it is used too quickly, there will not be enough to see things through to completion. Unlike fire-sign people, earth-sign people are not exciting, inspirational or outspoken because their purpose is not to stir things into action. It is to calm things and take them from the exciting, yet often unrealistic, stage of inspiration into the realistic, yet often boring, stage of planning and work. Don't expect earth-sign people to be initiators. Don't expect them to be exciting and unrealistic. This isn't their purpose. It isn't what they are meant to offer the universe. They are the meant to calm fire and bring it back to reality. Earth Houses - The excitement of fire is smothered into the realistic and practical issues of earth in the second, sixth and tenth houses. Here we get down to the business of putting fire's inspiration and expression into a real tangible form. We form it into something we can touch and see, hear and taste. If a profit can be made from it, we do that here also. In the second house, we focus on accumulating physical items and experiences for ourselves. In the sixth house, we work with others in the physical and material realm and in the tenth house, we deal with our place in the world in terms of career and how we affect the world with our achievement. Always third in each group, air analyzes and judges what earth formed and produced. Because air follows earth, air's purpose is to push forward by giving a new thoughtful analysis of what earth has structured and formed. ﻿As the third element in each group of the zodiac, air's job in the universe is to analyze what fire inspired into action and earth formed into reality. Air wants to know how the energy of fire and earth affect the universe. This is why air is a birth. It is a new outlook and point of view, but it is a subsidiary birth. It is secondary and supplementary to fire's birth in that it doesn't inspire something new. Rather, it takes a new look at what has already been inspired. In this way, air judges, and because it judges, it tries to remain unbiased and detached. Air asks questions and plays the devil's advocate so that every angle is examined. It looks at the creation in its finished form and judges its worth and impact. Air picks it apart to understand it. Then, it judges its impact on each individual person and the world in general. Air Houses - We take a new look at things and examine them in the air houses. In this way, the air houses represent a re-birth. In these houses, nothing new is started, but new ideas about things are born. Adjustments are made after things are examined and discussed. In the third house we analyze our immediate environment by trying to see how everything works together. The seventh house is where we analyze our relationships and how we interact. Then, in the eleventh house we analyze our place in the world at large. Always fourth in each group, water experiences and feels what fire inspired, earth structured and air analyzed. ​Because water follows air, water's purpose is to stop intellectualizing so we can simply experience with raw feeling. As the fourth element in each group, water is the only element that emotionally feels what was inspired by fire, built by earth and analyzed by air. Water doesn't start anything new with inspiration, it doesn't structure and it doesn't ask questions and stir new ideas. It simply completes the last step by experiencing without changing anything or judging anything. Water has true depth that comes from diving in and actually experiencing with feeling the things the other elements dream up, manipulate or analyze. Water experiences without using words or ideas or the physical senses. As the last element in the sequence, there is nothing deeper and nothing beyond it. So, the experience of water is an ending. Its ability to completely immerse and feel represents the ultimate in experience with nothing beyond it. Therefore, it represents the last step in the cycle of the zodiac before the next time we meet fire. In being the last step, its death is a transformation and preparation for new birth in fire. Water-Sign People - Because their purpose is to feel and experience, water-sign people have deep insight, trust their feelings and can read people well. They have a suspicious nature because they read their environment with feeling rather than facts or the physical senses. Open to feeling whatever comes their way, they absorb their emotional environment and understand its language clearly. Yet, it is difficult to translate emotions into words. So, they are lacking when it comes to expressing themselves, and often unable to use tact to express themselves politely or clearly. Their feeling nature causes them to internalize whatever they encounter and process experiences and interactions through their own unique set of personal filters along with their current mood. Therefore, their reactions can be unpredictable. Water Houses - Representing the last stage in the cycle, the water houses are about depth of experience. The water houses put an end to the analyses and discussions of the air houses in favor of simple emotion experience. Nothing is created, put into physical form or analyzed. Rather, after all of these previous stages are complete, the water houses are where the final product is lived in the most profound way possible, through emotion. In this way, these houses are endings. In the fourth house, we experience the depth of our emotional selves in the most personal parts of lives - our home and family. In the eighth house this experience is through intimate relationships, and in the twelfth house it is through our emotional experience of existence itself. Don't Look at me like I'm Crazy! 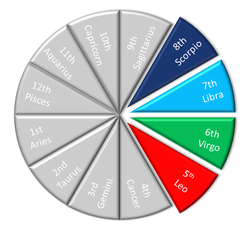 The order of the elements in the zodiac determines which elements are least similar and therefore understand each other the least. Because earth follows fire and because water follows air, each of these pairs differ greatly. They are meant to counter each other in order to transition into new realms and continue the progress of development around of the zodiac. 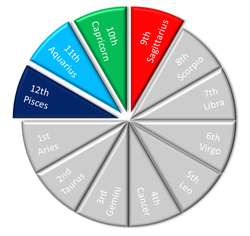 Ultimately this also determines which zodiac signs are most different. The exuberance and enthusiasm of expression that mark fire is a stark contrast from the practical and realistic nature of earth. These two elements are opposites and earth is actually meant to diffuse fire and bring fire's unrealistic nature into physical form. Both energies are necessary in the balance of the universe and it's their difference that makes them work together to keep the world functioning smoothly. When it comes to people, you will notice that earth-sign people differ the most from fire-sign people. The detached, analytical nature of air is completely different from the deeply emotional experience of water. They are opposites in their outlooks and experiences, but they are both necessary in the balance of the universe. Water must end the discussions and analyses of air in favor of emotional experience in order to keep the cycle of the zodiac progressing. In people, it is obvious that water-sign people differ the most from air-sign people.